ZF Friedrichshafen AG supplies the new BMW 3 series with its eight-speed automatic transmission, making BMW the first automaker to offer an automatic transmission with that many gears in the compact-premium segment in Europe. Available as an option on both gasoline and diesel engines in the 3-series range, the eight-speed transmission shift gears in 200 milliseconds, which is faster than a professional driver. ZF also supplies the BMW with its six-speed manual transmission, torque converter, various electronic and chassis components and continuous damping control. This system processes data gathered from sensors and other vehicle systems such as ABS and transmits the information to the dampers, which optimize damping levels to reduce vehicle pitch, roll and vertical motion and improve vehicle safety and passenger comfort as well as reduce braking distances. 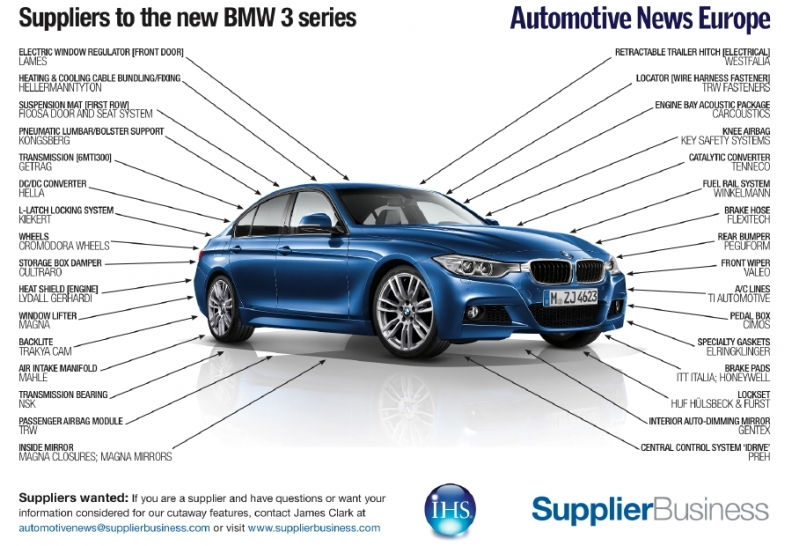 The new BMW 3 series is the sixth generation of the automaker's best-selling model. The car made its public debut at the Geneva auto show in March 2012. Output began in November 2011 at BMWs facility in Munich, Germany, which IHS Automotive forecasts will reach peak 3-series production of 245,000 in in 2014. The 3 series is also made at BMW's factory in Regensburg, Germany and built from kits by contract manufacturer Avtotor at its plant in Kaliningrad, Russia.